The currency used in the Republic of Ireland is the Euro. The currency used in Northern Ireland is the Pound Sterling. Retailers in areas close to the border may be willing to accept both currencies. In general, ATMs are easily found in all Irish cities and towns. In the villages, ATMs are generally located at filling station forecourts and in certain shops like supermarkets. It is advisable to withdraw cash in town before taking an excursion into the more remote areas – it may be difficult to find an ATM in service in some of the outlying villages. Credit cards are widely accepted across Ireland. Ireland offers a full range of accommodation, from campsites and hostels to five-star hotel and spa complexes. Family-run B&Bs and guesthouses generally offer a good standard of accommodation all over Ireland, and at competitive prices. Some hostels are conveniently located close to where bus routes pass through popular walking areas, making this an option for the independent traveller. 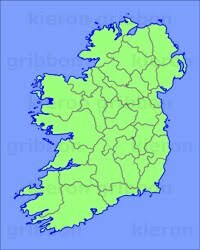 Ireland is located in the Greenwich Mean Time zone, sharing the same time as Great Britain, Iceland, Portugal, and some countries in northwest Africa. In either March or April each year (this varies), the clocks are put forward one hour for the purposes of daylight saving. In October, the clocks are put back one hour. Located between the northern latitudes of 51° and 56°, Ireland experiences a wide range of daylight hours throughout the year. The amount of daylight available needs to be taken into account before planning a long walk, otherwise there is an increased risk of finishing in darkness during winter months.